The J&A is along a dirt, sometimes rock, sometimes creek bed road. It speaks to another time, a simpler time but in reality, a much harder time. Today, we just appreciate that it is here thinking little of the settlers who originally came to dig a well or build a home and stake out a life in this wild setting. I originally became familiar with this area because of the progressive nature of the ranchers here. They raise beef. Recognizing that isn’t to everyone’s liking, for those that do eat it, this is the beef that you want to eat. 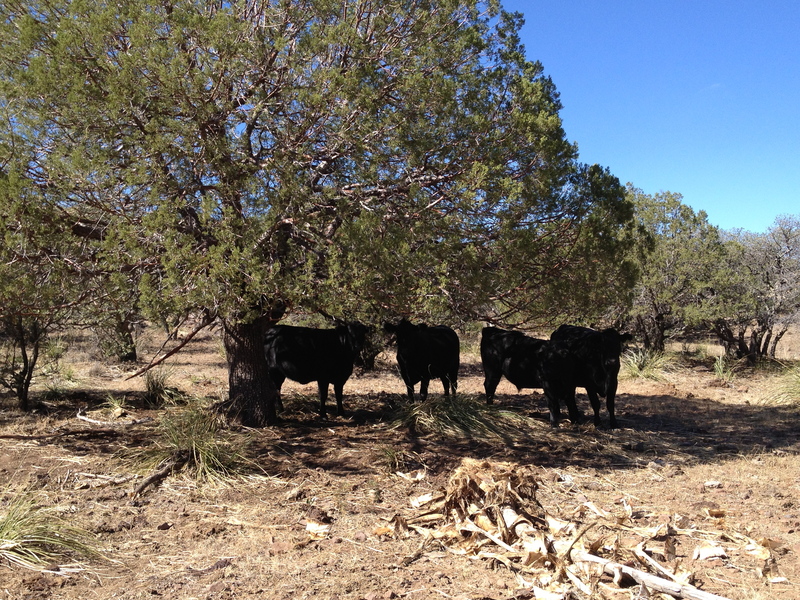 These cattle are grass fed from the wild grasses of the land supplemented by their own choice of mesquite. Mesquite is an extremely high protein bean, ensuring that the meat coming from here is low fat and high quality and if you must eat it, the beef that you should seek out. No hormones – just beef as it has been for nearly 200 years. Several years ago, fearing the onset of subdivision developers, Kelly Glenn Kimbro and her family changed the nature of their business by establishing a conservancy for their land. 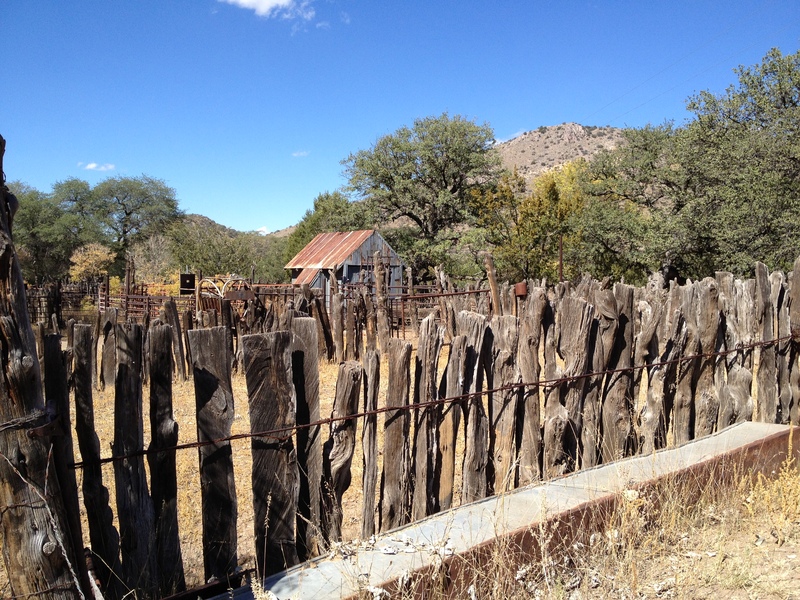 Known as the Malpai Borderlands Group, the existing ranchers placed their ranches inside a protective easement shell ensuring that they’d be maintained as ranches into perpetuity. Working alongside environmentalists – something that is rare, this forward thinking group established best practices for the work that they do such as land rotations and purposeful burning. The result is recognized around the world as one that has produced a setting where humans and wildlife and ranchers and those seeking to protect the environment, coexist in harmony – something that was constructed through civil discourse unlike we see today. Beyond your clothing and post-dinnertime board games, the only thing you need to bring to this lovely place is food. With three growing boys, a full-grown husband and one girlfriend, this proved challenging. The closest store is 30 miles away on a dirt road where you’ll top out at about 15 miles per hour. Had we stayed longer than a weekend, I would have certainly have to have made that trek or else learn the finer preparation of juniper berries and wild gourds. Shelter Island, NY is a world away from the Malpai but there, the Sylvester Manor posted this hearty, sweet potato black bean chili. I packed up a modified list of ingredients – vegan, even though we were at a cattle ranch. Heat oil in a Dutch oven over medium-high heat. Add sweet potato and onion and cook, stirring often, until the onion is beginning to soften, about 4 minutes. Add garlic, chili powder, cumin and salt and cook, stirring constantly, for 30 seconds. Add water and bring to a simmer. Cover, reduce heat to maintain a gentle simmer and cook until the sweet potato is tender, 10 to 12 minutes. Have you had a total getaway from electronics where you could spend time just spending time? I can completely see why chili is range and ranch food – even if ours was vegan. It’s so hearty and warm after a long day. That chili looks delicious. Love the use of sweet potatoes. I’ve had so many to use up! I think we’re finally through it now. How long did you stay in New Zealand? I love the idea of that conservancy and they chose an excellent place to do it! I think SE AZ is one of the best kept secrets. I love it more each time I visit. Oh that this concept would spread like the wildfire that destroys vast regions of our great nation not graced by stewards like the Malpai! I can hardly wait to whip up a batch of this chili for the next Places, Spaces, and Faces Community Potluck! Thank you for continuing to educate, inspire … and entertain!!!! Let me know how the chili turned out Kathleen. There is a lot of opposition to ranching but the practices of this group are definitely the least destructive. How did the chili turn out? Sounds like a wonderful weekend Tammy. Thanks for sharing information about this special place. It is a lovely spot Bonnie – very wild still. What a rich cultural area. Thanks for the chili recipe which was just in time as next week the temps are going to drop and chili will be a perfect compliment. Melissa, let me know how you like it. I love this time of year and chili is one of the main reasons. It can be made from so many things. Are you able to buy free range grass fed cattle Charlie? I so appreciate the information and recipes you bring us. You give me hope each time I read your posts . ..and challenge me to keep thinking and cooking better. Thank you, Tammy! You are a very special woman! Very interesting about the mesquite! It is a super high protein bean that creates a wonderful smoky sweet flour. I use it in some recipes so it only makes sense that the cows love it too. That chili looks heart-warming and tummy-filling. Sounds like you had a wonderful time spending time on the dude ranch, dude! It was a sensational getaway and I’m dying to go back. There is something so appealing about working the land. Love cell phone drop-out! That looks delish Tammy! If you try the dish, go to the original recipe at Sylvestor Manor. I doubled mine and it probably wasn’t as good. It is a good combo though. Living without internet is difficult, isn’t it? I found a place at the top of one mountain where I went on horseback that I could get a signal! Sounds like an interesting place! Might have to check it out next time I’m visiting my parents in Arizona! Southern AZ is a beautifully kept secret. The mountains, air, culture – all lovely and diverse. Holy enviro-coolness. I love the inventiveness of the famers’ convservancy idea. Thanks for opening my eyes to this part of the country! I think I recall that you’re in Puerto Rico? My husband and I have been there a couple of times and truly, there would be benefit in establishing such a set up there – even without the cattle. 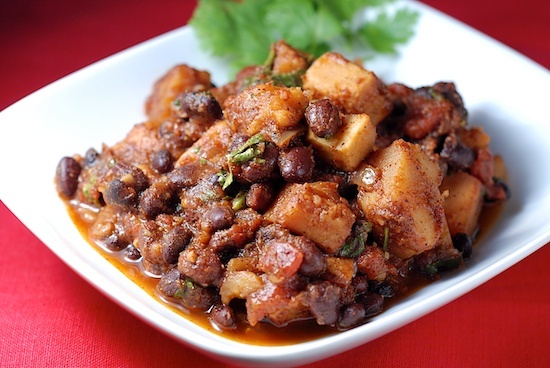 What a wonderful adventurous trek and the sweet potato black bean chili looks wonderful and just the ticket for my dish to take to the halloween party! Thanks Tammy for a insightful, interesting journey through conservancy. Sally, just like I told Jackie – if you do make it, click the link and use their recipe. Ours was good but I jiggered with the quantities. Mesquite-fed cattle–who would have thought? No need to buy those chips for a barbeque. It sounds an idyllic place to go, Tammy. Lovely to be away form it all. But oh, the food packing which must be done! Imagine forgetting the tin opener! Or having to learn to use the ancient one (by American standards) that was in the drawer of the ranch kitchen! What a great weekend! It’s great to see ranchers being active in preserving their grazing tradition. The lack of technology access is such a breather. If I am working in the backyard I tend not to hear the phone, and my cell phone is kept inside the house so I don’t hear it either. It is a wonderful break from the business of the week and helps ground me for the remainder of the day. Nature is grounding, isn’t it? It seems so odd that we need to be reminded of that sometimes. The conservancy provides a nice example of how groups that are often at odds can find common ground and work together to achieve common goals. The stronger we focus on our commonalities rather than our differences, the more we will see those differences blur. I’m with you Rob and I believe that much of our community leadership going forward has to be laser focused on commonalities and listening. We’ve got a lot of room to grow here. It’s a fantastic place but we did go through the groceries! I became very focused on what and how I would feed them again and again and again. Bill and I encountered the Malpais when we made our first cross-country drive in 2005. Some areas were covered in rough volcanic rock leftover from ancient flows. it was astonishing to imagine people trekking across that harsh and barren land. I’m glad to learn about the ranchers banding together to protect the land from developers. off topic–when were you on Shelter Island? I spent many childhood summers on the shores of Peconic Bay watching the ferries chug over to Shelter Island and back. Great that you’ve experienced it. I only read a blog from Shelter Island and have not visited. My father and I raised cattle for much of my life. I grew up with beef in the freezer. A steak wasn’t something that cost a forturne to me. It was just something that you thawed out and grilled. The steak we raised was grass fed and,at the end, grain fed. There were no hormones. I love that idea of those wanting to farm and those wanting to conserve nature co-exist, although it doesn’t make any sense to me why they wouldn’t wan to do so in the first place. What does a farmer – a person who depends on the land for livelihood – gain if his land becomes diminished or unusable through misuse. I’m romanticizing the idea about the ranches being ranches into perpetuity. I’d like to see farmland set that way also since we’ve moved so much of it up for housing developments here. The ranch sounds great & that dish makes me smile:) Yummm! Vegan too Sophie! Even at a cattle ranch. We just picked up a quarter of beef from a local grass-fed operation. Does the mesquite affect the flavor of the beef? I do not eat enough meat to answer that – sorry. This place looks amazing, that is how I would love to live! Mmmm sweet potato in chili, fantastic idea. I love my meat, so I think I might just add sweet potato to the mix next time! You’d be surprised how you might not even miss the meat. I sometimes make chili with TVP. Have you ever tried it? It’s very filling. Beautiful… despite my lack of blogging, I’m feeling the need of a weekend sans electronics! Highly recommended! And I miss your blogging. The food looks delicious and I bet the recipe will give a divinely mouth-watering end result. The place does look so far away from civilization but I bet it was so peaceful and away from the stressful busy city life. I think it’s really healthy to get away and to get into nature. What a fascinating post, to conserve the ranches as living breathing entities safe from development. It gives me hope! It is a great conservancy concept for many reasons. It’s good for the land and for the rancher and therefore for the community and economy too! Let me know if you do try this recipe Claire.